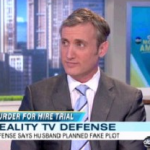 Dan Abrams on GMA: Dippolito's reality TV defense is "one of the craziest"
Dan Abrams discusses the defense offered by Diana Dippolito’s lawyer that her contracted hit on her husband was actually a ploy to land a reality TV series, and that he was in on it the whole time! Uh…plausible, I guess? In an alternate universe? To see the full interview, click here.